1 K.G. Jebsen - Center for Exercise in Medicine at the Department of Circulation and Medical Imaging, Norwegian University of Science and Technology, Trondheim, Norway. © Zisko et al. ; Licensee Bentham Open. To investigate how a change in VO2max induced through 6 weeks of high intensity aerobic interval training affects daily total energy expenditure (TEE), active energy expenditure (AEE) and mitochondrial function in people not previously exposed to structured high intensity aerobic interval training (AIT). Thirty healthy males (39±6 yrs) not exposed to structured exercise training were randomized to either 1x4 min AIT (1-AIT), 4x4 min AIT (4-AIT), both at 90-95% maximum heart rate (HRmax) or 47 min of MCT at 70% HRmax. TEE, AEE, number of steps, active time, sedentary time, VO2max and mitochondrial function in m. vastus lateralis were measured before and after intervention. TEE increased 14% (p=0.014) and AEE increased 43% (p= 0.004) after MCT. There was no change in TEE or AEE after 1-AIT or 4-AIT, but 1-AIT had significantly lower TEE (p=0.033) and step-count (p=0.011) compared to MCT post intervention. VO2max increased 7% after 1-AIT (p= 0.004) and 9% after 4-AIT (p=0.004), with no change after MCT. No change was observed in maximal mitochondrial respiration (VMAX) or Citrate Synthase (CS) activity within or between interventions. Basal respiration (V0) increased after 1-AIT (p=0.029) and 4-AIT (p=0.022), with no significant change after MCT. AIT interventions that increase VO2max, do not stimulate subjects to increase TEE or AEE. The intensity of exercise seems to play apart, as MCT increased TEE and AEE and AIT did not. Emphasis should be placed on the importance of maintaining everyday activities when introducing structured exercise training to untrained individuals. Keywords: high intensity training, VO2max, daily energy expenditure, mitochondria. Data shows that despite reduced energy intake, obesity prevalence is on the rise, suggesting that there must be a dramatic decrease in total energy expenditure (TEE) on the population level [1, 2]. It is, therefore, in public health interest to explore ways to increase TEE. Most variable component of the TEE is activity energy expenditure (AEE) and as such it also has the greatest potential to influence TEE. Decrease in AEE is also the most likely culprit for the observed decline in TEE [3, 4]. Cross-sectional studies have revealed that those with high fitness (measured as VO2max) are more physically active in their daily life than those with low fitness [5-7]. VO2max is a modifiable parameter and it can be increased through exercise training. High intensity aerobic interval training was found to improve VO2max more effectively than moderate continuous training [8, 9]. Training required for modification of the VO2max can also affect the cell mitochondrial function. Mitochondria are the energy powerhouses of the cell and as such provide the much needed energy required to maintain muscle contraction during physical activity (PA) through mitochondrial respiration, or aerobic metabolism within the cells . Endurance training has been shown to cause doubling of mitochondrial enzymes and to influence mitochondrial function and mitochondrial content (measured as citrate synthase activity), which were also found to differ between trained and untrained individuals [10-13]. However scientific literature is lacking in studies that look at how a change in VO2max induced through high intensity aerobic interval training affects TEE, AEE and mitochondrial function over a longer time period in people not previously exposed to structured high intensity aerobic interval training. The present investigation is a proof-of-principle study designed to assess whether changes in TEE and AEE occur in response to changes in VO2max. The primary outcome variable used for statistical power calculation was TEE. With a TEE of 3000 kcal∙day-1 and a daily 20% increase in non-exercise activity to 3600 kcal∙day-1, 7 subjects per group were needed for 80 % power at a significance level of 5%. Prior experience suggests a standard deviation (SD) of 350 kcal . We aimed to include ten subjects to each group in case drop-outs. Thirty apparently healthy men in Trondheim, Norway, were recruited in Feb-May 2011 through announcement. Inclusion criteria: no structured exercise for at least one year, age 30-50, body-mass-index (BMI) <30 kg·m-2. Exclusion criteria: weekly structured PA, cardiovascular-and-pulmonary-disease, kidney-failure, movement disabilities, orthopedic and/or neurological limitation to exercise, alcohol and/or drug abuse or participation in another study. Study was performed at the Norwegian University of Science and Technology (NTNU) and all subjects signed informed consent pursuant to law. Study was approved by the Regional-Ethics-Committee (REC Central, #2010/1541) and registered in Clinical-Trials (#NCT01313468). After the initial screening, subjects were randomized 1:1:1 to either: (1) aerobic interval training with a one 4-minute-long interval (1-AIT), (2) aerobic interval training with four 4-minute-long intervals (4-AIT), or (3) moderate continuous exercise training (MCT) (Fig. 1). Simple randomization was done at NTNU’s unit for applied clinical research. With ethical approval, subjects were “blinded” to the main outcome measure and informed that the aim of the study was to investigate the effect of different exercise intensities on resting metabolic rate. Tests and measurements were carried out at baseline (PRE), and after 6 weeks of exercise training (POST). All training and testing was performed at the core facility NeXt Move at the Norwegian University of Science and Technology (NTNU). Study Flow-chart. 1-AIT=1x4 minutes of interval training. 4-AIT=4x4 minutes of interval training. MCT=moderate continuous training. Daily activity patterns. (A) Total Energy Expenditure (TEE) in kilocalories∙day-1. (B) Active Energy Expenditure (AEE) in in kilocalories∙day-1. 1-AIT=1x4 minutes of interval training; 4-AIT=4x4 minutes of interval training; MCT= moderate continuous training. *Significant differences within groups from PRE (Baseline) to POST training intervention (p ≤ 0.05) are identified. style="background-color: # Significant differences between groups (p ≤ 0.05). Mitochondrial respiration at PRE and POST intervention. (A) 1-AIT=1x4 minutes of interval training. (B) 4-AIT=4x4 minutes of interval training. (C) MCT=moderate continuous training. *Significant differences within groups from PRE (Baseline) to POST training intervention (p ≤ 0.05). All exercise training was supervised. Subjects met for structured training at St. Olav’s Hospital in Trondheim three times per week for six weeks. Exercise training consisted of walking or running on treadmills, (PPS55 Med, Woodway GmbH, Germany), and all exercise sessions started with a 10 minute warm up and ended with a 5 minute cool down period. The structured exercise training was performed as: (1) 1-AIT – 1 x 4 minute interval at 90-95% of HRmax (total exercise time 19 minutes including warm-up) (2) 4-AIT – 4 x 4 minute intervals at 90-95% HRmax with 3 minute active breaks at 70% of HRmax between intervals (total exercise time 40 minutes including warm-up), and (3) MCT – moderate continuous training at 70% HRmax (total exercise time 47 minutes) with 4-AIT and MCT being isocaloric. The inclination and/or speed of the treadmill were increased to achieve the desired intensity (85-95% HRmax). To be compliant, subjects had to complete 15 of the 18 possible training sessions (80% compliance). Levels of daily PA in this study were assessed by Sensewear (BodyMedia 7, Pittsburgh, PA) and reported as TEE and AEE. The device has previously been validated and found accurate in estimating the energy expenditure during free living conditions . Subjects wore Sensewear on the upper right arm covering the triceps brachii. Armband is equipped with multiple sensors: motion, steps, galvanic skin response, skin temperature and heat flux, which together with demographic characteristics (age, gender, smoking status, left or right handedness) are used in an algorithm (which is not released by the manufacturer) to predict energy expenditure (TEE in kcal·day-1, AEE in kcal·day-1). Additional information predicted by the algorithm based on the user input includes basal metabolic rate (BMR) as calculated using the World Health Organization (WHO) equation , number of steps, lying and sleep time in min·day-1, intensity in metabolic equivalents of task (METs), frequency and duration of PA. Sedentariness was defined using Sensewear default as activity of up to 3 METs, moderate as activity from 3 to 6 METs, vigorous as activity from 6 to 9 METs and very vigorous as activity of 9 METs or higher. Subjects were instructed to wear Sensewear continuously for 7 days except during water exposure at baseline and post training intervention (14 days total). A recent article estimated that 2 days were needed to reliably estimate TEE when using Sensewear . Therefore, subjects with at least two valid days were included in the analysis. Only days where the On-body duration was more than 23 hours were defined as valid days (95% wear time). Prior to testing, calibration of gas-analyzers was done using the ambient air and a known concentration of gas mixture. The inspiratory-flow-meter calibration was done automatically. CPET was performed on a treadmill to determine subjects’ VO2max at baseline (PRE) and post training intervention using mixing-chamber-gas-analyzer-ergorespirometry (Jaeger Oxycon Pro, Viasys Healthcare, Germany). Test was initiated using inclination and speed derived from warm up and individual ramp protocols were used to reach VO2max. Subjects wore a mouth-piece connected to the Jaeger Oxygen Pro and a nose-clip during the test. Speed and treadmill inclination were increased every 1-2 minutes until subjects reached VO2max. Levelling-off of oxygen uptake despite an increase in workload and respiratory-exchange-ratio (RER) >1.10 were used as a criteria for reaching VO2max. Highest heart rate was recorded during the VO2max test using Polar Accurex RS300X SD monitor (Polar Electro, Finland). HRmax was then calculated by adding 5 beats to this highest recorded heart rate during the VO2max test, as previously suggested . HRmax was used to calculate the required training HR. Maximal oxygen pulse was calculated as an estimate of stroke volume during maximal exercise using pre and post VO2max (L·min-1) values and HRmax (Beats· min-1) values respectively (VO2max·HRmax-1). Muscle samples were acquired from the m. vastus lateralis at baseline and 48 hours after the last training session by using a standard Bergström biopsy needle in local anaesthesia by Xylocain with adrenaline . Tissue was separated into two parts, and one part was immediately transferred to a separation solution  and kept on 4°C for mitochondrial respiratory analyses and another rapidly snap-frozen in liquid nitrogen for later analysis. Mitochondrial respiration was assessed in situ on saponin-permeabilized muscle fibers [21-24]. Detailed description of the analysis performed in our lab was previously published by Brønstad et al. . After completion of the procedures all fibres were dried and respiration rates given as micromoles O2 per minute per kilogram dry weight muscle tissue. Activity of Citrate Synthase (CS) was assessed using Sigma Aldrich Assay Kit (SC0720). Briefly, frozen muscle tissue was thawed, weighed and placed into Eppendorf tubes containing Precellys bead. Cellytic buffer was added to muscle in a 1:20 ratio. The mix of buffer and muscle was homogenized using Precellys 24 at 6500 rpm, 2x8 sec, 8 sec pause program. The homogenized liquid was then centrifuged at 15000 rpm for 10 min at 4°C. The pellet was discarded and the supernatant was collected into clean Eppendorf tubes and used for subsequent analysis. Activity of Citrate Synthase (CS) was assessed using Sigma Aldrich Citrate Synthase Assay Kit (SC0720). Detailed description of the analysis performed in our lab was previously published by Brønstad et al. . The CS activity was expressed in mol∙ kilogram-1∙hour-1. Statistical analysis was performed using SPSS software version 20 (Statistical Package for Social Science, Chicago, IL, USA). An ANCOVA was run to determine the effect of three different exercise-training programs on post-intervention activity, mitochondrial function and CS activity parameters after controlling for pre-intervention activity parameters with the difference/∆-value used as dependent factor, group as the fixed factor and baseline values as covariates . Visual inspection of a scatterplot was used to assess whether there was a linear relationship between pre- and post-intervention activity, mitochondrial function and CS activity parameters for each intervention type. Homogeneity of regression slopes as the interaction term was tested and standardized and residuals for the interventions and for the overall model were tested for normal distribution using Shapiro-Wilk's test. Visual inspection of a scatterplot and Levene's test of homogeneity of variance were used to ensure there was homoscedasticity and homogeneity of variances. Outliers were assessed by no cases with standardized residuals greater than ±3 standard deviations. P-value ≤ 0.05 was considered statistically significant. Sensitivity test was performed in the form of intention to treat analysis. A paired-samples t-test was used to determine whether there were any significant mean differences within groups. Results are presented as mean ± standard deviation (SD). Correlation between change (Δ) in VO2max and change in TEE and AEE were examined using a Pearson correlation coefficient. There was a linear relationship between pre- and post-intervention parameters for each intervention type, as assessed by visual inspection of a scatterplot. Homogeneity of regression slopes as the interaction term was not statistically significant. Standardized residuals for the interventions and for the overall model were normally distributed (p>0.05). There was homoscedasticity and homogeneity of variances, as assessed by visual inspection of a scatterplot and Levene's test of homogeneity of variance (p>0.05), respectively. There were no outliers in the data, as assessed by no cases with standardized residuals greater than ±3 standard deviations. Data from 24 of the 30 included subjects recruited between Feb 2010 and May 2010 was included in the analysis (Table 1). In 1-AIT, 4-AIT and MCT groups 8, 7 and 9 subjects, respectively, completed the training protocols. The achieved compliance to training of those that completed the intervention was 95%. There were no exercise related adverse events. Physical characteristics of study subjects. Abbreviations: 1-AIT=1x4minutes of interval training. 4-AIT=4x4 minutes of interval training. MCT= 46 minutes of moderate continuous exercise. BMI = body mass index. m=meters; kg=kilograms. Activity data absolute values at baseline (PRE) and POST Intervention. * Abbreviations: 1-AIT=1x4minutes of interval training. 4-AIT=4x4 minutes of interval training. MCT= 46 minutes of moderate continuous exercise. ActTime= Active time. SedTime= Total daily time spent in activities of less than 3 METs. ModTime=Total daily time spent in activities of 3-6 METs . VigTime= Total daily time spent in activities of 6-9METs. PRE = (baseline) data collected prior to commencement of exercise intervention. POST=data collected post exercise training intervention *Significant differences within groups from PRE (Baseline) to POST training intervention (p ≤ 0.05). Maximal cardio-respiratory parameters PRE and POST Intervention. Abbreviations: 1-AIT=1x4minutes of interval training. 4-AIT=4x4 minutes of interval training. MCT= 46 minutes of moderate continuous exercise. * Significant differences within groups from PRE (Baseline) to POST training intervention (p ≤ 0.05). MET=Metabolic Equivalent of Task. VO2 = maximal oxygen uptake; VE = maximal pulmonary ventilation; RER = maximal respiratory exchange ratio; HRmax = Maximal heart rate; PRE = baseline data; POST= post intervention data *Significant differences within groups from PRE to POST training intervention (p ≤ 0.05). There was a 14% increase in TEE after MCT (p= 0.004, Fig. 2A). There was no change in TEE after 1-AIT or 4-AIT, but a significant difference in TEE was observed between MCT and 1-AIT (p=0.033, Fig. 2A). The 1-AIT had the lowest post-intervention TEE, which was significantly lower than the MCT. AEE improved 43% (p=0.014, Fig. 2B) after MCT with no significant changes after 1-AIT or 4-AIT, and no differences between the groups. 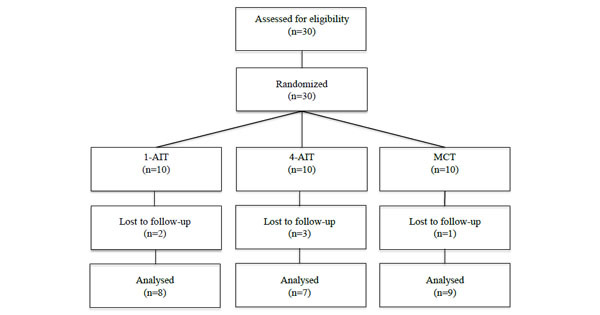 Relative increase in Active Time was 36% (p=0.015, Table 2) after MCT with no significant changes after 1-AIT or 4-AIT and with no differences between the groups. The number of daily steps at post-intervention was significantly higher after MCT compared to the 1-AIT (p=0.011, Table 2). VO2max increased 7% after 1-AIT (p= 0.004, Table 3) and 9% after 4-AIT (p=0.004, Table 3), There was no change in VO2max after MCT, with no differences between the training groups. Oxygen pulse improved 8% after 1-AIT (p= 0.05, Table 3) and 11% 4-AIT (p= 0.00, Table 3), but not after MCT, with no differences between training groups. There was no significant correlation between ∆VO2max and ∆TEE (r=0.017, p=0.938), or ∆VO2max and ∆AEE (r=0.072, p=0.737). Muscle biopsies were successfully obtained from 23 subjects in total, 9 subjects from 1-AIT, 7 subjects from 4-AIT and 7 subjects in MCT. One of the subjects did not undergo biopsy due to vasovagal syncope, while the biopsy sampling procedure was unsuccessful at baseline in the remaining 6 subjects. No significant difference was found in maximal mitochondrial respiration (VMAX) or CS activity after 1-AIT, 4-AIT or MCT, with no differences between interventions. Basal respiration (V0) increased from 1.13 to 1.76 μmol∙min-1∙kg-1 after 1-AIT (p=0.029, Fig. 3A) and from 0.85 to 1.52 μmol∙min-1∙kg-1 after 4-AIT (p=0.022, Fig. 3B) with no significant difference after MCT and with no differences between interventions. No significant change was observed among interventions or after 1-AIT, 4-AIT or MCT in maximal activity of complex II (VSUCCINATE), and IV (VASCORBATE). When maximal mitochondrial respiration was normalized to CS activity, no difference was observed after 1-AIT, 4-AIT or MCT, with no differences between the interventions. Physical characteristics of six subjects lost to follow up were tested against the 24 subjects who completed the study and found not to be statistically different in any parameters except age (p=0.021), sedentary time (p=0.011) and sleep time (p=0.011) with subjects lost to follow up having higher sedentary, lower sleep time and being older compared to those who completed the study. The main finding of our study is that high intensity aerobic interval training that induced a change in VO2max had no effect on TEE, AEE or mitochondrial function, while MCT produced a significant change in TEE and AEE despite generating no change in VO2max. To our knowledge this is the first clinical study that has looked at how a change in VO2max, induced through high intensity aerobic interval training affects TEE, AEE and mitochondrial function. Our results are in line with previous findings that show that high intensity aerobic interval training improves VO2max more than moderate continuous training and that 1-AIT is just as effective as 4-AIT in improving VO2max in untrained men [8, 9]. Since the 1-AIT and 4-AIT groups did not change their physical activity patterns from pre to post training intervention, we can conclude that the change in VO2max observed after these two training intervention occurred as a direct result of the intervention and not as a result of overall increased physical activity. Cross-sectional studies have shown that fitter individuals are more active during free living and spend more time per day standing or walking than less fit individuals [5-7, 27]. However, a change in VO2max does not seem to affect activity levels, as is evidenced by our findings. The two high AIT groups that increased their fitness experienced no change in their activity patterns while the MCT group, which experienced no change in fitness, increased TEE, AEE and time spent in PA. In addition, the MCT group had significantly higher number of steps per day post training intervention compared to 1-AIT. Some have hypothesized that that an increase in energy expenditure during one part of the day (i.e. structured exercise) will be compensated for by a similar decrease in energy expenditure during another part of the day (i.e. increase in sedentary time) in order to maintain stable level of PA and TEE over time . However, evidence regarding this hypothesis has been conflicting [29, 30]. A decline in non-training PA has been reported in several studies in elderly subjects [31-33], middle-aged men  and obese youth  engaged in exercise training programs. It was suggested that compensation to exercise is particularly tied to exercise intensity and that due to its fatigue inducing ability, high intensity exercise could affect daily PA levels by restricting additional daily PA and so TEE [6, 31, 36]. Our findings are in line with this hypothesis as both the short and the long duration AIT produced no effect on TEE or AEE from pre to post training intervention. It seems that intensities above 90% of HRmax, at least in this study, could have contributed to a hypothesized threshold at which compensatory responses occurred, thus producing no change in TEE in the two high intensity training groups. However, further studies with larger and more diverse populations are needed to confirm our findings. We observed no effect of training on maximal mitochondrial respiration or CS activity. We did see a significant increase in basal mitochondrial respiration in response to AIT but not MCT. Other studies that have looked at the effect of training on mitochondrial respiration reported an increase in basal mitochondrial respiration immediately after exercise , within 48 hours of exercise  and no change within 7 days after exercise in either sedentary, active or athletic populations . Since our biopsies were taken 48 hours after the last exercise session, the observed increase in basal mitochondrial respiration, and hence metabolic rate could be short lived. A recent study that looked at the effect of three 1-AIT, 4-AIT and MCT sessions on post-exercise oxygen consumption (EPOC) concluded that that 4-AIT produced the highest EPOC with no difference in EPOC between 1-AIT and MCT, indicating that EPOC can be manipulated by changes in intensity and duration of exercise, with a positive effect of intensity on EPOC . The study showed that 1-AIT compared with MCT gave similar results in EPOC, even though 1-AIT group exercised for 19 min compared with 47 min in the MCT group. How and if the increase in basal mitochondrial respiration is related to EPOC needs further investigation. Research shows magnitude of changes in CS activity to vary greatly with exercise type and duration, muscle fibre type and composition, age, training status and biopsy timing [38-40]. Studies observed an increase in CS activity immediately following acute exercise , one hour after acute exercise , after 7-10 days of daily 2 hour cycle training , after 2 weeks of sprint-training in recreational cyclists and after 12 weeks of 6 weekly sessions of running/cycling . All these studies were done with cycling as the exercise method of choice. We saw no change in CS activity after AIT or MCT. It is possible that running and cycling differ in their effect on muscle adaptations to exercise and thus mitochondrial respiration and that running requires much longer time for these adaptations to take place. We therefore conclude that since no peripheral changes in skeletal muscle mitochondrial function were detected, the change in VO2max that was observed after AIT groups is most likely a function of stroke volume, as peak oxygen pulse, an indication of stroke volume, increased with no change in HRmax . Our study had some limitations. All study subjects exercised together. MCT group witnessed AIT training, perhaps perceiving it to be more effective. As a result they could have inadvertently modified their non-exercise PA. Due to invasiveness of our protocol, the number of participants was low. This could have resulted in loss of statistical power in analysis of the mitochondrial respiration. Furthermore, we observed no differences in VO2max amongst groups. This is most likely due to fact that our study was powered for TEE as primary outcome. Moreover, this study included only male subjects and generalizations regarding results on other populations wouldn’t be appropriate. Studies with larger diverse populations are needed to confirm our findings. In conclusion, this study shows that high intensity aerobic interval training interventions that increase VO2max, do not stimulate subjects to increase their daily PA (measured as AEE), nor TEE. The intensity of exercise seems to be of importance for daily TEE and AEE, as MCT increased TEE and AEE with no change in these parameters after AIT. Emphasis should be placed on the importance of maintaining everyday activities when introducing structured exercise training to untrained individuals. There are no disclosures to report and no conflict of interest. The work was supported by grants from the K.G. Jebsen foundation and the liaison Committee between the Central Norway Regional Health Authority and the Norwegian University of Science and Technology. There are no disclosures to report or any conflicts of interest. The funders had no role in study design, data collection and analysis, decision to publish, or preparation of the manuscript. The authors thank Ingerid Arbo, Anne Berit Johnsen for technical assistance. Heini AF, Weinsier RL. Divergent trends in obesity and fat intake patterns The american paradox Am J Med 1997; 102: 259-64. Astrup A. The american paradox the role of energy-dense fat-reduced food in the increasing prevalence of obesity Curr Opin Clin Nutr Metab Care 1998; 1: 573-7.
 WHO Global strategy on diet, physical activity and health 2014 Available from http: //wwwwhoint/dietphysicalactivity/pa/en/ cited January 15 2014. Hunter GR, Weinsier RL, Bamman MM , et al. A role for high intensity exercise on energy balance and weight control Int J Obes Relat Metab Disord 1998; 22: 489-93. Brochu M, Starling RD, Ades PA , et al. Are aerobically fit older individuals more physically active in their free-living timeκ A doubly labeled water approach J Clin Endocrinol Metab 1999; 84: 3872-6. Meijer EP, Goris AH, Wouters L , et al. Physical inactivity as a determinant of the physical activity level in the elderly Int J Obes Relat Metab Disord 2001; 25: 935-. Novak CM, Escande C, Gerber SM , et al. Endurance capacity, not body size, determines physical activity levels role of skeletal muscle pepck PLoS One 2009; 4: e5869. Helgerud J, Hoydal K, Wang E , et al. Aerobic high-intensity intervals improve vo2max more than moderate training Med Sci Sports Exerc 2007; 39: 665-71. Tjonna AE, Leinan IM, Bartnes AT , et al. Low- and high-volume of intensive endurance training significantly improves maximal oxygen uptake after 10-weeks of training in healthy men PLoS One 2013; 8: e65382. Daussin FN, Zoll J, Dufour SP , et al. Effect of interval versus continuous training on cardiorespiratory and mitochondrial functions relationship to aerobic performance improvements in sedentary subjects Am J Physiol Regul Integr Comp Physiol 2008; 295: R264-72. Brooks GA, Fahey TD, Baldwin KM, Eds. Human bioenergetics and its adaptations 4th ed New York McGraw-Hill Companies. 2005. Bassett DR Jr, Howley ET. Limiting factors for maximum oxygen uptake and determinants of endurance performance Med Sci Sports Exerc 2000; 32: 70-84. Jacobs RA, Lundby C. Mitochondria express enhanced quality as well as quantity in association with aerobic fitness across recreationally active individuals up to elite athletes J Appl Physiol 2013; 114: 344-50. Tooze JA, Schoeller DA, Subar AF , et al. Total daily energy expenditure among middle-aged men and women the open study Am J Clin Nutr 2007; 86: 382-7. Harris AM, Lanningham-Foster LM, McCrady SK , et al. Nonexercise movement in elderly compared with young people Am J Physiol Endocrinol Metab 2007; 292: E1207-12. St-Onge M, Mignault D, Allison DB , et al. Evaluation of a portable device to measure daily energy expenditure in free-living adults Am J Clin Nutr 2007; 85: 742-9. FAO/WHO/UNU Energy and protein requirements Report of a joint fao/who/unu expert consultation world health organization technical report series annex 1 Available from http: //wwwfaoorg/docrep/003/aa040e/AA040E15htm#an1cited January 15 2014. Almeida GJ, Wasko MC, Jeong K , et al. Physical activity measured by the sensewear armband in women with rheumatoid arthritis Phys Ther 2011; 91: 1367-76. Ingjer F. Factors influencing assessment of maximal heart rate Scan J Med Sci Sports 1991; 1: 134-40. Berström J. Muscle electrolytes in man Scand J Clin Lab Invest 1962; 14: 7. N'Guessan B, Zoll J, Ribera F , et al. Evaluation of quantitative and qualitative aspects of mitochondrial function in human skeletal and cardiac muscles Mol Cell Biochem 2004; 256-257: 267-80. Kuznetsov AV, Veksler V, Gellerich FN , et al. Analysis of mitochondrial function in situ in permeabilized muscle fibers, tissues and cells Nat Protoc 2008; 3: 965-76. Saks VA, Veksler VI, Kuznetsov AV , et al. Permeabilized cell and skinned fiber techniques in studies of mitochondrial function in vivo Mol Cell Biochem 1998; 184: 81-100. Zoll J, Sanchez H, N'Guessan B , et al. Physical activity changes the regulation of mitochondrial respiration in human skeletal muscle J Physiol 2002; 543: 191-200. Bronstad E, Rognmo O, Tjonna AE , et al. High-intensity knee extensor training restores skeletal muscle function in copd patients Eur Respir J 2012; 40: 1130-6. Vickers AJ, Altman DG. Statistics notes analysing controlled trials with baseline and follow up measurements BMJ 2001; 323: 1123-4. Hunter GR, Weinsier RL, Zuckerman PA , et al. Aerobic fitness, physiologic difficulty and physical activity in black and white women Int J Obes 2004; 28: 1111-7. Ridgers ND, Timperio A, Cerin E , et al. Compensation of physical activity and sedentary time in primary school children Med Sci Sports Exerc 2014; 46: 1564-9. Reilly JJ. Can we modulate physical activity in childrenκ Int J Obes 2011; 35: 1266-9. Wilkin TJ. Can we modulate physical activity in childrenκ No Int J Obes 2011; 35: 1270-6. Goran MI, Poehlman ET. Endurance training does not enhance total energy expenditure in healthy elderly persons Am J Physiol 1992; 263: E950-7. Meijer EP, Westerterp KR, Verstappen FT. Effect of exercise training on total daily physical activity in elderly humans Eur J Appl Physiol Occup Physiol 1999; 80: 16-21. Morio B, Montaurier C, Pickering G , et al. Effects of 14 weeks of progressive endurance training on energy expenditure in elderly people Br J Nutr 1998; 80: 511-9. Wasenius N, Venojarvi M, Manderoos S , et al. Unfavorable influence of structured exercise program on total leisure-time physical activity Scand J Med Sci Sports 2012; 24: 404-13. Kriemler S, Hebestreit H, Mikami S , et al. Impact of a single exercise bout on energy expenditure and spontaneous physical activity of obese boys Pediatr Res 1999; 46: 40-. Meijer EP, Westerterp KR, and Verstappen FT. Effect of exercise training on physical activity and substrate utilization in the elderly Int J Sports Med 2000; 21: 499-504. Larsen I, Welde B, Martins C , et al. High- and moderate-intensity aerobic exercise and excess post-exercise oxygen consumption in men with metabolic syndrome Scand J Med Sci Sports 2014; 24: e174-9. Trappe S, Harber M, Creer A , et al. Single muscle fiber adaptations with marathon training J Appl Physiol 2006; 101: 721-. Leek BT, Mudaliar SR, Henry R , et al. Effect of acute exercise on citrate synthase activity in untrained and trained human skeletal muscle Am J Physiol Regul Integr Comp Physiol 2001; 280: R441-7. Luden N, Hayes E, Minchev K , et al. Skeletal muscle plasticity with marathon training in novice runners Scand J Med Sci Sports 2011; 22: 662-70.